The fog seems to have cleared and now the Clarets can get their Premier League campaign started. After picking up just one point from a possible 15, the club's worst start to a season since 1927, the forecast appears much brighter as Sean Dyche's side got up and running. There seemed to be an identity crisis in those early games, Burnley were almost a shadow of their former selves, unfamiliar on so many levels, as they shipped an average of two goals a game and more than 20 shots against them. The players and management team met up in the week to discuss their predicament - as they had done three years ago before embarking on a 23-game unbeaten run in the Championship - and they responded just as impressively on this occasion. Burnley were significantly better, hungrier, the tempo was heightened, they were first to the second balls and there was a greater understanding between the three banks. They just seemed to want it more. Matt Lowton's reinstatement brought more of a familiarity to the back four and a better understanding with Icelandic winger Johann Berg Gudmundsson. Matej Vydra was handed his full debut and the Czech Republic international made a significant difference. The movement of last season's Championship top scorer gave the home side a new dimension, he pulled defenders out of position, linked play well and found pockets of space in key areas. There were still flaws, it was far from perfect but it was a step in the right direction. The start was positive but it was Eddie Howe's Bournemouth who went close to taking the lead at Turf Moor. Nathan Ake's shot looped up off the boot of Ben Mee but, with Joe Hart scrambling back to his line, the ball came back off the crossbar. Hart gathered an attempt from David Brooks and Diego Rico dragged a shot wide for the visitors as the Clarets defence stood their ground well. It took until the midway point for the home side to register their first real chance as Gudmundsson's corner travelled all the way through to Sam Vokes at the far post but the Welshman couldn't get the ball out of his feet to finish. Charlie Taylor then volleyed wide of the target when a combination of Asmir Begovic, Callum Wilson and Jefferson Lerma failed to clear Gudmundsson's corner convincingly. The Cherries went within a whisker of breaking the deadlock again when Brooks picked out Joshua King on the right hand side but Wilson couldn't get a toe on the cross at the back post at full stretch. And then came the game-changing window. Burnley don't make a habit of scoring twice in the first half. They did it just four times last term against Chelsea, United, Swansea and Leicester City but they achieved that feat again. The home side netted twice in as many minutes before the interval. Vydra was first in the 39th minute, hammering the ball home from close range after Ashley Westwood had twice been denied by Ake. Lennon then scored his first goal in the top flight for more than two-and-a-half years. The winger, who had netted in a 3-2 defeat for Everton against West Ham in 2016, peeled around the back to poke Gudmundsson's cross in to the corner, with both Steve Cook and Adam Smith distracted by Vokes. 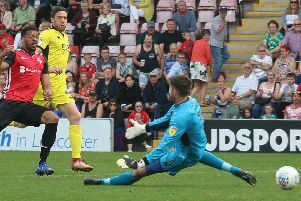 The Clarets had a knack of restricting the opposition to shots from distance last term and that was the case as Howe's men sought a way back in to the game. This time it was Lerma who zipped a shot over the crossbar. Vokes turned Gudmundsson's cross wide of the post as the Clarets looked to extend their lead while Gudmundsson tested Begovic when moving central to let fly with his left boot. Substitute Chris Wood threatened when stealing a yard from Cook to head Gudmundsson's delivery wide at the near post but, at the other end, Brooks was starting to becoming a menace when moving in to huge pockets of space. The midfielder, signed from Sheffield United, got in behind the Burnley defence after King had won possession but Hart saved well with his legs. The visitors continued to move the ball around the penalty area but, with the hosts dogged and determined, blocking all passing lanes available, Bournemouth just couldn't find a way through. Eventually, the Clarets rounded the game off emphatically as substitute Ashley Barnes arrived at the double. The striker fired home on the rebound once Gudmundsson's volley from Lennon's cross had cannoned back off the upright. And then he stroked the ball in to the corner after Lennon pulled the ball back from the right hand side having worked the channel well from Westwood's pass.